What business challenges keep you up at night? 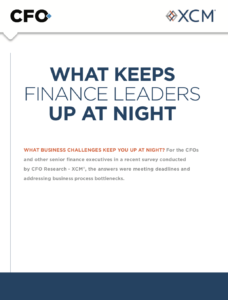 For the CFOs and other senior finance executives in a recent survey conducted by CFO Research – XCM®, the answers were meeting deadlines and addressing business process bottlenecks. Download this research project on workflow technologies, or business process solutions that help CFO’s visibly see their business process in real time.